What’s New for the 2013 Scion xD? Wondering why to buy the 2013 Scion xD over the 2012 model? While the updates to this model year are minor, they’re worth taking into consideration before making your decision. From the outside in, the 2013 Scion xD gets smoked headlights, available two-tone paint, updated instrument panel trim pieces, and an optional BeSpoke premium sound system. Additionally, you can purchase a limited-edition “10 Series” trim level built especially for the model’s ten-year anniversary. While similar in looks to the Nissan Versa Note, the 2013 Scion xD has plenty of redeeming qualities that stand it apart from its competitors. The base model gets 16-inch steel wheels, while the fancier 10 Series limited edition trim comes with alloy wheels, unique headlights, and an illuminated rear badge. One of the best things about the xD is its customizability. Dealer-installed options include a rear spoiler, remote engine starter, and a ton of TRD performance parts. The 2013 Scion xD comes with one engine and one engine only: a 1.8-liter four cylinder motor that generates 128 horsepower and 125 pound-feet of torque. The engine is powered by either a five-speed manual or a four-speed automatic transmission which drives power to the front wheels. 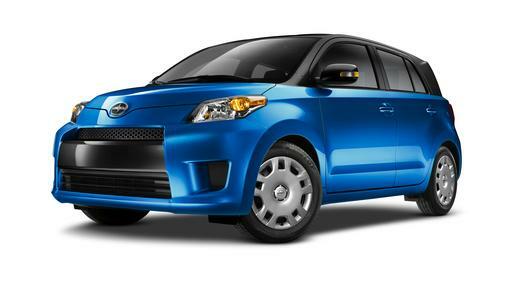 As you might expect for a small car, the 2013 Scion xD is about as efficient as they come. Its engine returns an impressive 27 mpg city/33 mpg highway, and 29 mpg combined. These numbers run true for the xD equipped with either the manual or the automatic transmission. Inside the 2013 Scion xD, you’ll find plenty of style and utility. It boasts a rather bare interior, which makes the xD appear uncluttered and clean. The dark gray coloring is refined, while the matte-finish metallic trim brings to mind a much more expensive vehicle. Legroom is abundant, even in the rear seats, which have reclining backs and sliding bottoms to allow you to customize your position for a more comfortable journey. Speaking of space, the xD has 35.7 cubic feet of cargo space, which is about average for this segment. Moving onto entertainment, the xD’s controls are easily reachable on the center stack, and the optional BeSpoke audio system syncs to your iPhone via an app that consolidates Facebook, Twitter, Yelp, and Internet radio. Small cars sometimes scrimp on safety, but not the 2013 Scion xD. The compact hatchback comes with front-seat side-impact airbags, side curtain airbags, active head restraints, antilock brakes, and stability control, to name a few. When tested by the Insurance Institute for Highway Safety, the xD received the highest possible rating of “Good” in both the frontal and side-impact crash tests.